If you're looking for a spacious home inside & out where you can simply enjoy entertaining your family & friends... this is "the one"! 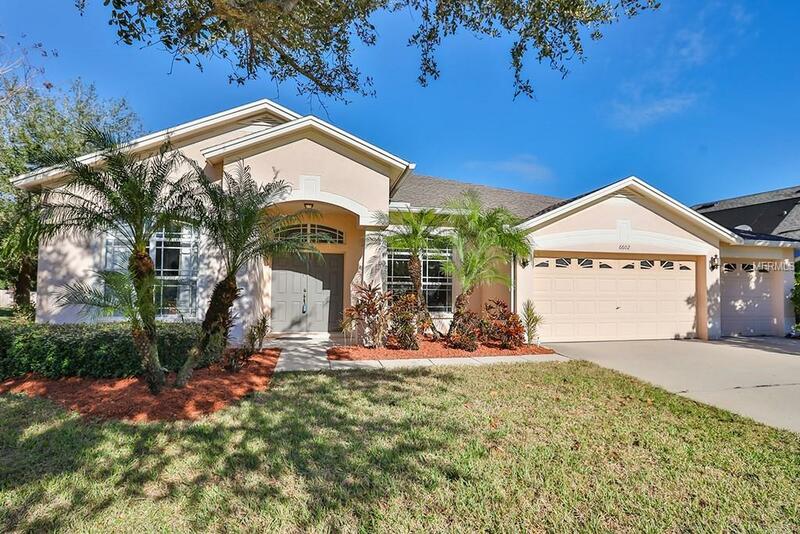 This well designed one-story, pool home offers 5 bedrooms, 3 bathrooms, 2,947 sq ft, a 3-car garage & is situated on a .30 acre corner, fenced lot offering a gorgeous caged pool/spa. The kitchen is the anchor of the home offering a center island, granite counters, stainless appliances and a central location overlooking the family room with beautiful views of the pool area. The master bedroom offers an en suite bathroom complete with dual sinks, a built in vanity, a shower and separate soaking tub. This large home has a great way of wrapping it's arms around you when you walk in the door and making you feel cozy & right at home! Located in Covington Park which is open to the new community of Waterset (both communities were developed by Newland Communities) where you have access to the jogging trails, summer outdoor concerts/events, fireworks on the 4th, and cafe. Covington Park offers community pools, sports fields and multi-use courts, playgrounds, a recreation room & a fitness center. Conveniently located near I-75, US 41, the Crosstown, US301 & I4. Call today! Additional Lease Restrictions Contact Hoa.